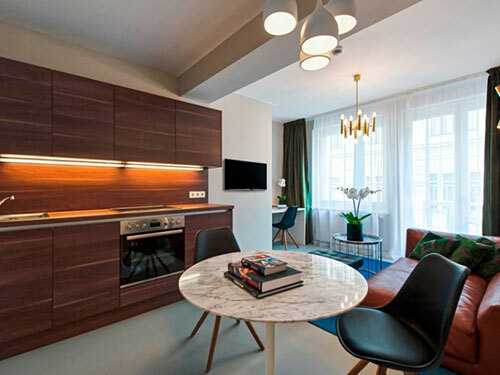 If you are commuting to Vienna for business, our apartments offer everything you need to start your work without having to look for accommodation, furnishing or authorities. On our homepage you will find all our apartments and you can decide, which apartment is best located to your office. Or you tell us the address of your office and we tell you which apartments have the best accessibility for you. If you need to Check-in lately, because you already have to work on you first day in Vienna, we offer you a flexible key box Check-in. So you can come to the apartment at any time and do not have to wait. You will receive all information via e-mail. If you prefer a personal check in, our team will gladly welcome you at the apartment. For your home away from home, our apartments all are high quality furnished with a mix of modern and vintage. Our handmade boxspring beds help for excellent sleep. All kitchens are fully equipped, from Nespresso coffee machine to toaster, water kettle, stove, oven, cutlery, dishes and kitchen utensils. Each of our apartments has its own internet connection. Our internet is unlimited and available in high speed so you can work and surf at home. We can send the invoice to your company address or home address. You can conveniently pay by bank transfer, credit card, cash or bank debit. We can hand over your invoice personally, send it via e-mail, or place it in your apartment, what is most convenient for you. Of course, our invoices are issued with VAT, so you can use them for your tax declaration. If you need to stay longer than planned, just let us know and we can extend your stay without any problems. If you are very busy and do not have time to look after your apartment? We offer weekly cleanings and linen change. If you need the cleanings more or less frequently, we will gladly organize it for you. No time to find out the best restaurants and bars in the city? We have already done this for you and you receive personally tested recommendations from us. Special tips? We will be happy to find everything you need to know from A like allergic friendly cafés to Z like Zoo Vienna.